In 1961, two musicians who'd met as Bard College classmates entered the studio to record their mutual debut album. Jeanne Lee and Ran Blake emerged with The Newest Sound Around, an iconic pairing of voice and piano that was simultaneously intimate and adventurous, stark yet boundless, intensely focused but warmly embracing. Lee and Blake would continue to tour together sporadically through the 1960s, but fans had to wait nearly three decades for a follow-up release, You Stepped Out of a Dream, in 1989. Their lifelong friendship and collaboration came to a close with Lee's death in 2000. Miraculously, The Newest Sound You Never Heard now doubles the material available from this unparalleled duo. The double album was released January 25, 2019, just a few days before Lee would have celebrated her 80th birthday, via A-Side Records in conjunction with the Ran Blake Foundation and New England Conservatory, where Blake has taught for more than 50 years, and under the generous umbrella of VRT-Archive and their employees who were very kind in allowing this material to come out. 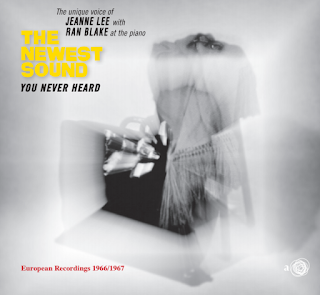 The Newest Sound You Never Heard collects nearly two hours of previously unheard material recorded in Europe in 1966 and 1967. These soul-stirring performances sound wholly unique, profoundly moving and thrillingly immediate despite having been captured more than half a century ago. Dominique Eade, another supremely gifted singer and NEC faculty member with whom Blake has enjoyed a fruitful collaboration, writes in her liner notes that, "Hearing these recordings after knowing their previous work so well creates a sensation similar to that of dreaming you have found an extra room in your house: It is at once familiar and otherworldly." Recorded by the late Belgian composer, producer and Jazz Middelheim festival founder Elias Gistelinck, The Newest Sound You Never Heard was captured at the studios of Belgian radio and television station VRT (then BRT - Belgium Radio and Television) and at a live performance in Brussels. The tapes remained in the VRT archives for nearly 40 years until being rediscovered. Their existence was brought to Blake's attention Eli Kessler, at that time a student drummer at NEC who learned of them while in Brussels. From there, Blake and A-Side founder Aaron Hartley licensed the material for this breathtaking release. The Newest Sound You Never Heard finds Lee and Blake venturing through a wide range of repertoire, from American Songbook standards to jazz classics by Duke Ellington and Charlie Parker, through more experimental fare by Ornette Coleman, Julian Priester and Abbey Lincoln to then-contemporary pop hits by The Beatles and Bob Dylan. Each piece becomes a thorough reimagining of the source material, often startling in its crystalline beauty and bold unpredictability. The musicians are unafraid to revel in fraught silences or veer off the expected pathways into unfamiliar territory. "There is no one like Jeanne Lee in the world," declares Blake. "She was the most incredible human being: her sage wisdom, her charm, her wittiness, her humor, her feelings for humanity and her kindness to everybody in the world. She was such a vibrant personality and, of course, what a voice. I felt she'd be in my life till the very end." Sadly that was not to be the case, but in her deeply-felt and probing duets with Blake, Lee left behind a rich and searching legacy. A fearless experimentalist with a wide-ranging tone, she collaborated with a host of innovative voices including Anthony Braxton, Archie Shepp, Mal Waldron, Marion Brown, John Cage and Gunter Hampel. She also contributed to Carla Bley's masterpiece, Elevator Over the Hill. Lee and Blake met as freshmen at Bard in 1956. They bonded over their shared love for Billie Holiday and Thelonious Monk; Lee had grown up in the Bronx, next door to Monk's sister-in-law, Skippy. Like their revered debut, which opened with a version of "Blue Monk," The Newest Sound You Never Heard begins with a Monk composition - in this case, a mysterious and enchanting take on "Misterioso" with words taken from a poem by Gertrude Stein. The album wends its way through a variety of moods, from the wistful "On Green Dolphin Street" to a rambunctious "A Hard Day's Night;" the playful tug-of-war of the nonsensical "Ja-Da" to an ominously urgent "Something's Coming;" the foreboding moan of Ornette Coleman's "Lonely Woman" to the stunningly aching rendition of "The Man I Love," constantly threatening to get lost in love's reverie. "The sound just came to us," Blake says in regards to finding their distinctive take on each song. "I wanted to grow in her direction and she would listen to me. We worked on repertoire, phrasing, dark colors, modulation, themes, plots, characters - but the sound took care of itself." Both Lee and Blake also take a few solo turns: Lee stuns with her sensuous a cappella version of "Billie's Blues," capturing the song's (and Billie Holiday's) complicated whirl of emotions, defiant yet desirous, steely and vulnerable. Blake essays a knotty exploration of Fats Waller's "Honeysuckle Rose," an alternately hushed and thunderous run through "God's Image," and a pair of originals - the cinematic "Smoke After Smoke" and the abstract "The Frog, the Fountain, and Aunt Jane." That sound, writes pianist (and former NEC colleague) Danilo Pérez in his liner notes, takes listeners on "a journey full of beauty and unexpected turns. Their music is a playground for the ear and a trip to incredible places for all souls alike. They may play a song, or they may choose to play the philosophy of the song." This welcome release is a treasure trove of unexpected delights and mesmerizing storytelling. Jeanne Lee and Ran Blake are both masters of interiorizing and excavating the emotions of a song, and The Newest Sound You Never Heard provides ample evidence of their evocative chemistry and heartfelt relationship. Blake's hope is that Lee "finds her place up there in the history, not just as a singer but as a fabulous musician and innovator." A place where he also belongs by her side, a fact of which these stellar recordings leave absolutely no doubt. In a career that now spans nearly six decades, pianist Ran Blake has created a unique niche in improvised music as an artist and educator. With a characteristic mix of spontaneous solos, modern classical tonalities, the great American blues and gospel traditions, and themes from classic Film Noir, Blake's singular sound has earned a dedicated following all over the world. His dual musical legacy includes more than 40 albums on some of the world's finest jazz labels, as well as more than 50 years as a groundbreaking educator at Boston's New England Conservatory.